Woodrail Centre is an 18-acre development located at the corner of Nifong and Forum Boulevard in the rapidly growing southwest area of Columbia. The Woodrail Centre setting is designed to harmonize with the established profile of the Woodrail residential area, while an emphasis on architectural detail has created a unique, multi-use professional business park. Full development will include 186,500 square feet. Warm brick exteriors are complimented by the full, arched entry ways with floor-to-ceiling paned windows. 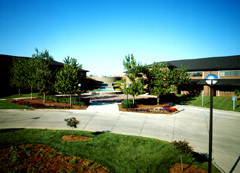 Multi-level waterscaping, featuring fountains and pools, invites the public into the plaza area of the business park.